A great alternative to Lobster, Live Spot Prawns are perfect for a candle light dinner creating the perfect intimate affair. Live Spot Prawns will give you and your guest the ultimate dining experience as the main entree or as a side. Sold only in 2.5 Lb. boxes. Available Live during certain times of the year. Live Spot Prawns will give you and your guest the ultimate dining experience as the main entree or as a side. Our Live Spot Prawns have a sweet delicate flavor that can be enjoyed by all. A great alternative to Lobster, Live Spot Prawns are perfect for a candle light dinner creating the perfect intimate affair. Our Live Spot Prawns can be prepared a number of ways including grilled, baked, sautéed, or boiled. Enchant your loved one with a delicious easy to prepare meal with our Live Spot Prawns and you just add the ambience. 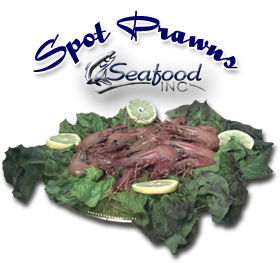 As a fresh spot prawns supplier we ship fresh and frozen spot prawns worldwide. Seafood Inc is dedicated to superior quality of its frozen and fresh spot prawns.